Naval Piranha 2: Now It's Personal! is the final level of World 4 in Yoshi's Woolly World. It is unlocked after collecting all forty previous Smiley Flowers in the world. 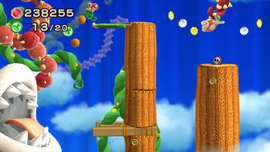 The level begins in an area with many vines. Once Yoshi reaches an Egg Block, Naval Piranha appears and gives chase. Yoshi will then encounter a few Shy Guys on Item Balloons, and then Piranha Plants on trampolines. After a while, Koopa Paratroopas also appear. More trampolines appear after that, as well as a slightly faster autoscroll. After a segment of trampolines and sponge dirt, a slighty faster autoscroll engages. Before long, Yoshi will reach another trampoline, causing the autoscroll to move even faster. Yoshi must then quickly eat the Shy Guys on Item Balloons to fill in the platforms, then continue past the sponge dirt and trampolines, followed by an area with spiky vines and Piranha Plants, followed by the final trampoline leading to the goal roulette. Smiley Flower 1: In a hidden Winged Cloud just after the first two Shy Guys on Item Balloons. Smiley Flower 2: In an alcove too narrow for Yoshi to enter. To get it, Yoshi must eat a Koopa Paratroopa and spit out its shell into the alcove so that it can run into the Smiley Flower. Smiley Flower 3: In a hidden Winged Cloud at a vine almost immediately after the second Wonder Wool. Smiley Flower 4: In some sponge dirt immediately after the fourth Wonder Wool. Smiley Flower 5: Just before the final trampoline, just over a Piranha Plant. 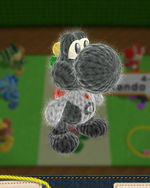 Yoshi must throw a yarn ball at it to collect it. Wonder Wool 1: Just above a Piranha Plant on a trampoline. Yoshi must simply flutter jump to get it. Wonder Wool 2: At the top left of three rows of sponge dirt. Wonder Wool 3: Up and to the left of a trampoline immediately after an Egg Block, just before the faster autoscroll. Wonder Wool 4: Revealed just after filling in the second platform after the faster autoscroll. Wonder Wool 5: In a patch in the ground near the final vine before the goal roulette. Collecting all of the Wonder Wools knits Nintendo 64 Yoshi back together. Big Pakkun no Gyakushū!! Big Piranha Strikes Back!! Geodaeppeokkeum'ui Yeokseup! Naval Piranha Strikes Back!! This page was last edited on March 20, 2019, at 01:19.